Firebase is a toolkit and infrastructure which purpose is to help you build better apps and grow a successful business. Firebase was bought by Google and now it is constantly improving in order to make your experience much more convenient and productive. It helps you develop high-quality apps, build a prototype or an MVP (minimum viable product), grow your user base, and earn more money as a result. Each feature works great independently, and they perform even better together. 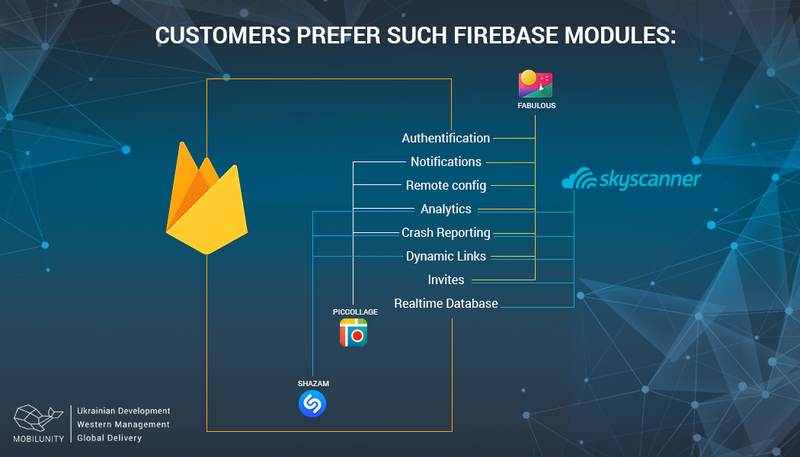 Firebase contains several free modules: Analytics, App Indexing, Authentication, Cloud Messaging, Crash Reporting, Dynamic Links, Invites, Notifications & Remote Config. Firebase also contains several paid modules for extending your possibilities while developing an MVP: Realtime Database, Storage, Hosting and Test Lab. If you want to know more about the paid modules, check the pricing here. You can also check out this page, if you are interested in development of mobile apps. Analytics. This module is quite similar to Google Analytics. It collects statistical data about the application and offers wide range of filters and parameters. This module helps you to promote your application as well. This tool can be very useful when you make a prototype, because you can test out your raw version of the app and analyze the collected data to define the potential of the app. Thus, you can increase the ability to improve it in case something needs to be changed. Auth. This Firebase module was created for user authorization. It supports authorization by email/password, Google account, Facebook, Twitter, github and guest authorization. In admin panel you can see the statistics on who and when signs in to the application. You can also add, delete or disable accounts with the help of this module. Realtime Database. This tool is more powerful comparing to the others listed. It is a cloud-hosted NoSQL database, which stores data in JSON in a form of a pair: key-value. Nevertheless this module can not substitute SQL database, Realtime database has two major features which are not present in ordinary SQL. The first one is synchronization of the data. It means that you don’t need to send new requests to the server, when you are working with the data and some changes are being made simultaneously by somebody else. Just add a callback and you will receive all the changes in this callback. The second feature is the possibility to work offline. When the connection will be available, all your changes will be synchronized and other users will be able to see what has changed. Realtime Database has different functions like sorting out and filtering query requests, or creating rules for accessing the data. Crash Reporting. This Firebase module collects the data about application’s crashes. You can see the detailed information about the device where the crash occurs and in which row of code it happened exactly. This can help developers to work on the bugfix much quicker than it usually requires. While developing an MVP it is really important to fix all bugs and crashes for the purpose of enhancement of user experience. Notifications. This module allows your app to send push notifications to the specific group of users or all of them. For sending a notification you need to fill only several fields in the admin panel and press the “send” button. As easy as that. Remote Config. This module helps you to create parameters in the admin panel and these parameters are synchronized with an application in real time. There is a limit in synchronization per hour, but this limit is quite big. And if you need to create a parameter which will be updated quite frequently, you can use the Database module. Storage. As you can already guess from its name, this module can be used in order to save files on Google Cloud. The number of functions is the one we are all accustomed to: you can upload, download and delete all the files from the cloud. For example, you can store avatars of users or other images which are uploaded by them. AdMob. This is the module for monetization of the app. For example, our developers tried to insert a simple advertising banner in one of our applications. It turned out quite simple and took only several rows of code. PicCollage uses next modules for the app: Analytics, Remote Config, Crash Reporting, Notifications. Fabulous uses next features: Analytics, Authentication, Remote Config, Crash Reporting, Notifications, Dynamic Links, Invites. Shazam uses next Firebase features: Analytics, Crash Reporting, Dynamic Links. Skyscanner uses next features: Analytics, Realtime Database, Crash Reporting, Dynamic Links, Invites. This list doesn’t end on this, and we can surely say, that Firebase is a reliable toolkit with convincing number of modules for you to create a mobile app, make a prototype or build and run a website. Google constantly improves Firebase, so that every feature corresponds to the latest tech trends and gives you more possibilities. Creating an MVP with the help of Firebase eventually allows you to run the successful business by seeing how the app is used and improving it. You can refuse using backend server if you don’t need to collect huge amounts of data or you don’t have a difficult database structure. Nowadays many companies and startups are in search of programmers for their piling-up ideas like an MVP development. This is why outstaffing solution is getting more and more popular due to the lack of professionals on the local markets of many countries. Our company has great experience in web and mobile app development and we can surely offer perfect candidates, who can develop unique high-quality products. We can build a prototype for you using the top-notch techs like Firebase. How Much Does It Cost to Hire a Java Spring Developer in Ukraine?